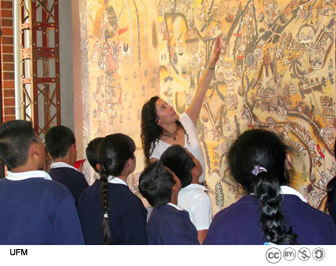 School groups visit the Lienzo de Quauhquechollan exhibition at a cost of Q5.00 per student. Educational materials related to the exhibit are available for individuals and classrooms. Banco G&T Continental and Universidad Francisco Marroquín sponsor groups of students from grades K-12 so they may visit the Lienzo de Quauhquechollan exhibit, Q5.00 per student in scholar groups. More than 18,000 students have visited the exhibition without charge since it opened in 2007. The guided tour for students takes one-and-a-half hours. It includes a narrated video that vividly recounts the military campaigns waged during the conquest of Guatemala. The trained guides encourage students to ask questions and to offer their own interpretations of the scenes depicted in the Lienzo.